i have been trying to make this scam report post on nairaland but it seems they keep banning me each time i create such thread.the thread will be removed or set hidden by mod and i will get ban for some days. i saw his advert on nairaland, Toshiba Satelite laptop with a price tag of 35k. i called him and he said he reside in abuja ( First Red Flag but i did not take note of this, my bad ). we agreed on part payment of 15k ( second Red Flag But i did not take note of it either ). he said he is going to make use of Agufure Transport to send it down to Lagos. as agreed, i paid the 15k that same day.he went to the park to send the package but on getting there, he said they charged him 7k for the transport ( Third Red Flag and this ring a bell in my ear). I told him to give the phone to the personnel so i can talk to him but the voice sounded like a scammer also.seems he was at home because i was wondering how he could have gone to the park so soon since he said the park was far from his area. he went in search for another transport.he did as said but they charged him 5k. due to time getting to closing hours for business, he told me he is going to send it the following day.i agreed. I called him in the evening but no response, later called him again at late hour and he told me he went for church service ( Another Red Flag ).we agreed to get it done the following day. The following day i called him and he said he has sent it via transport.this is where the whole saga started and made everything clear i have been scammed. He started telling me he could not get in touch with the driver during the whole day ( 5th Red Flag ). i tried to understand, probably it could be due to network problem since its a road journey.i was skeptical because he said he was going to make use of Agufure Parcel and not road side driver.i gave him time and later called in the evening, this time he refused to answer his calls ( 6th Red Flag which triggered The Biggest Red Flag Alert ).i said to my self, i have falling MuGU for this Guy. I refused to believe and continue calling, no response for more than 2 days.i kept on trying and he answered the call and asked who is this, i introduced my self and immediately he hung up the call and sent me a message that i should send my account number to him, i quickly sent it.he said 20 minutes he will make a transfer.i waited for the whole day, no alert. I called again through out but no response.kept calling and luckily he answered and told me he has not been able to get in touch with the driver, that he was afraid to answer my calls.i had to wait and see if any driver would call me but none called.i called him but no response for the whole day, following day no response either, kept calling. It got to Thursday,last week before Friday public holiday which was for eldel Fitri / Muslim SALA, he answered the call and said he has collected the package back from the driver. He asked if i would be patient, he will send it by Monday Being 21st Of July ( Public Holiday ).i told him to send the package on Friday which was also public holiday for sala. Since my mind was already made up that this guy has scammed me, i had to play by his rules, i called again but no response, i sent him text trying to make a point clear to him but he boldly told me that the name he is using to scam is not his real name but his Trade Name ( 7th Red Flag ). I started laughing because this is my first time of hearing such.so now one has trade name which they use in opening bank account, not surprised though. I still called him and he answered the call and told me he is going to send it on Monday. i gave him benefit of doubt and waited until Monday. Fast forward to Monday, i called him and he said he is about going to the park but suddenly it started raining in Abuja that Monday ( 8th Red Flag ).immediate he said that, i went ahead with personal stuffs on ground for that day and called him later in the evening, thinking he would have sent it but no response up till this very moment.so guys pick one or two red flags from this post. see images of scammer.if you can't see the image via mobile phone, then click on the image to zoom it.i used his phone number to search on google and got this. do not pay into any ones account even if its part payment for a product you've not seen. if you call a seller, do not tell him or her your location.first ask them where they reside and see what they say and if they tell you they reside in abuja, kaduna or any other long distance from your end, you should be at alert.you can play along and tell them you have some one there or you reside in same state and see what they will say.most of them will use price to chase you if they know you reside in same state because they don't want to transact with you, some may tell you they are not in the state, maybe they traveled for important quest.this should definitely signal Red Flag to you. you can also use facebook to search for the person using his name or phone number and go through their profile. Check their profile and do some diggings to see how often they update their profile.you may get their contact address via facebook if they leave it public. 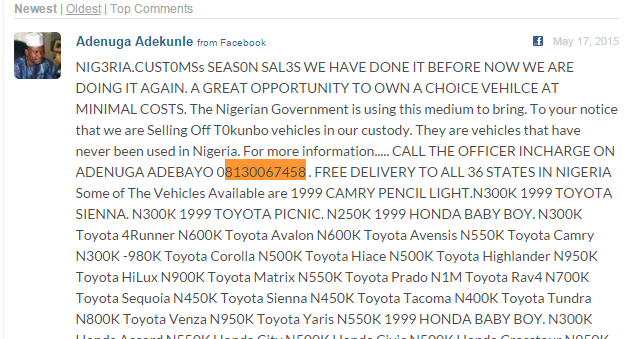 if a seller advertise on a forum, click his profile and check the date they registered.if the date is recent, then you should be at alert.like this guy that scammed me, the date he created most of his account was recent.like i said, i failed to carry out proper check due to the stuffs i was doing offline..
DON'T FORGET TO SHARE WITH YOU. FRIENDS ON FACEBOOK BY CLICKING THE SHARE BUTTON. 1 Responses to "How I Got Scammed Of 15k By Izebhokhae Frank ( 08159934441 ) On Nairaland"